Vasilii Andrianovich Slesarev began building and altering aircraft 1913, producing modified versions of Nieuport IV and Farman XVI, before designing Svyatogor giant biplane, with two front wheels and two 1.8m main wheels. Slesarev wanted 2 x 300hp Mercedes engines to go in central engine room, driving pusher propellers by shafts and gears, but had to settle for 220hp Renault. 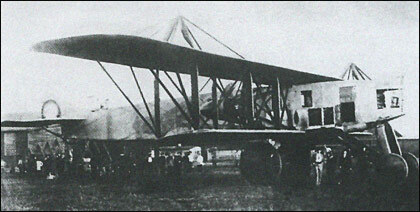 Construction began November 1914, and taxi tests began just two years later, but Svyatogor never got off ground. This truly was one big heap of plane. The twin nose wheels measured 1.5 m in diameter. The aircraft was grossly under powered using the Renault engines and never did fly, with Slesarev going to his death bed in 1921, without achieving his aim.